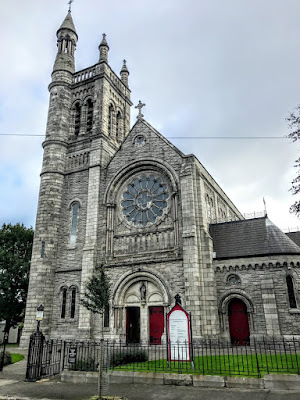 During my visit to the Church of the Holy Name on Beechwood Avenue earlier this week, I realised how this church was a fashionable venue for suburban weddings in south Dublin about 100 years ago. Two former Taosaigh were married here – Seán Lemass and Charles J Haughey – and Padraic Pearse was supposed to be the best man at the wedding here of another 1916 leader, Thomas MacDonagh and Muriel Gifford in 1912, but forget to turn up on the wedding day. But a plaque in the south porch also recalls another wedding – or rather, the two weddings of the parents of John French. Their first wedding caused a social stir and resulted in the children being declared illegitimate; the second wedding served to illustrate the dying pangs of the Penal Laws many decades after Catholic Emancipation, and stirred a lengthy debate about who were the legitmate heirs to an old family title. Died of wounds in France 2 July 1916. The Hon John French (1853-1916) was born into a landed and titled family on 13 March 1853, the eldest son of Charles French (1790-1860), 3rd Baron de Freyne of Coolavin. The family lived at Frenchpark House, near Boyle, Co Roscommon, and for many generations members of the family sat in the Irish House of Commons as MPs for Co Roscommon. John French, MP for Co Roscommon, was about to be given a seat in the Irish House of Lords as Baron Dangar in 1775, but he died before the peerage was formally created. His younger brother, Arthur (1728-1799), also an MP for Co Roscommon, turned down the offer of the peerage originally intended for his brother. But eventually a title came into the family when his grandson, Arthur French (1786-1856), MP for Roscommon (1821-1832) was made Baron de Freyne, of Artagh, Co Roscommon, in 1839. But Arthur and his wife Mary McDermott had no children, and when Arthur was widowed it became obvious that the title would die with him. So, he was given a new but similar title in 1851 as Baron de Freyne, of Coolavin in Co Sligo. This time, however, his younger brothers, John, Charles and Fitzstephen French, were named as heirs to the title, in the hope that this branch of the French family would never be without a titled representative. Lord de Freyne died in 1856, five years after the new title had been created. The older title, dating from 1839, died out, but the newer title, handed out in 1851, and was inherited by his first younger brother, the Revd John French (1788-1863), who became the second Baron de Freyne. The second Lord de Freyne was Rector of Grange Sylvae or Goresbridge in Co Kilkenny, and seems to have been more interested in breeding Irish red setters than attending to his parish or to politics in the House of Lords. When he died in 1863, the family title passed to the next surviving brother, Charles French (1790-1868), as the third Lord de Freyne. Unlike his elder brothers, Charles French was happily married and had a large family of seven children, six sons and a daughter, and so it seemed there would be no problem of the family estates, totalling almost 30,000 acres in the west of Ireland, and the family title having male heirs to ensure succession to both. Or so it seemed. On 13 February 1851, when he was in his 60s and when it still looked unlikely that he would ever inherit a title or have children, Charles French married a local woman, Catherine Maree, daughter of Luke Maree from Fairymount. She has been described as a ‘peasant girl’ who was born around 1830 or 1831. He was more than three times her age: she was 20 and he was almost 61 and the marriage was performed by a local Catholic priest. 1, Mary Josephine French (died 20 February 1919). 4, William John French (1854-1928). But by the time William was born on 21 April 1854, it had become obvious that Charles and his children were in line to the family title and estates, the legal validity of the marriage was questioned. She was a Roman Catholic and he was a member of the Church of Ireland, and the surviving legacy of the Penal Laws, even in the 1850s, meant a member of the Church of Ireland could only legitimately marry in the Church of Ireland. The obscure interpretation of the law was causing scandals in society and eventually legislation was needed to rectify a legal anachronism and injustice when the marriages of Barry Yelverton and succession to title of Lord Avonmore were challenged in the courts in 1861-1864. And so, Charles and Catherine were quietly married a second time in 1854, perhaps in the hope of legitimising their four children, and ensuring succession to the title and estates. This time the wedding took place on 17 May 1854 in All Saints’ Church, Grangegorman, Dublin, and was performed by the Revd William Maturin. Charles gave his address as the Albert Hotel, which was in Dominick Street, Dublin, and his occupation as ‘late captain’; Catherine gave her address as Anna Villa, North Circular Road, which technically made her a resident of the parish. He was then 63 and she was 23; he describes himself as a bachelor, she as a spinster, although their fourth child had been born within the previous month. She was illiterate and signed the register with an X. 6, Richard Patrick French (1857-1921). Lord de Freyne celebrated his 68th birthday on the day his youngest son was born in 1858. He died on 28 October 1868, and in 1869, all six of his sons arrived as boarders at Downside Abbey, the Benedictine-run Catholic public school in Somerset, near Bath. They were all to be educated as Catholics, despite the confusion of their parents’ marriages. But it was still uncertain which son was going to succeed to the family title. The Yelverton case had been heard and appealed, and new legislation on legitimacy had been enacted. The Roll of the House of Lords, which was issued each year, shows blanks against the name of the holder of the de Freyne peerage in 1875 and 1876, indicating that the matter was still undecided, and the estates were administered on behalf of the family by Valentine Dillon, whose daughter later married John French. Eventually, however, lawyers decided the 1851 marriage was invalid and any children born in that marriage were illegitimate. The first four children continued to use the prefix ‘The Hon,’ indicating they were the legitimate children of a peer. But Arthur French, the first son born after the 1854 marriage, succeed as 4th Baron de Freyne. The former Catherine Maree died on 13 November 1900. Arthur French was known as a cruel landlord and ruled his estate and his family with a rod of iron. In 1902, when his tenants refused to pay their rent, he took leading members of the Irish Party to court, accusing them of incitement. When he died, Frenchpark and the title passed to his eldest son, Captain Arthur Reginald French. In 1902, as a 23-year-old, this Arthur was also at the centre of a society scandal that the London evening newspapers called ‘a romance of the peerage’ when he married an 18-year-old barmaid and single mother, Annabel Angus, Rothes in Scotland. He was a lieutenant in the Royal Fusiliers with mounting mess debts. She was already the mother of a small child, and had a brief marriage to another officer that had ended in a quick divorce. But they had no children and the future Lord de Freyne soon grew tired of his wife. Less than three years after their marriage, he went to New York and spent his days and nights drinking in the Bowery. When he disappeared, leaving his luggage in a New York hotel, his family and former friends feared that he had been kidnapped or murdered. After a search that lasted several weeks, and he was found at Fort Slocum on Long Island, where he had enlisted as a private in the US army. When he succeeded to the title in 1913, he was an American soldier in the Philippines. He returned to Frenchpark, but without Annabel. When World War I broke out, he returned to the army, and was killed in action at the Battle of Aubers Ridge in Flanders in 1915. He is among four members of this family who died in World War I and are named in plaques in the Catholic Parish Church in Frenchpark: Edward Fulke French (1886-1919), who fought in the Dardanelles and died a prisoner of war in Mainz; George Philip French (1890-1915), killed in action in Flanders; and Ernest Aloysius French (1894-1917), who died of wounds in Flanders in 1917. Meanwhile, his uncle John French, the second son who was excluded by law from inheriting the titles and estates, was living in Cobh (Queenstown), Co Cork. John French was a Resident Magistrate or JP for Co Kerry (1892-1898), Co Limerick (1898) and Co Roscommon. On 26 July 1877, he married Nannie Dillon. They were the parents of 10 children, six of whom survived, but two of those sons died within weeks of each other in World War I, and this is the family commemorated in the south porch in the Church of the Holy Name in Beechwood Avenue. World War I took on a severe toll on this branch of the French family. John French was also a distant cousin of two key players in the 1916 Rising, Charlotte French (1844-1939), better known as Madam Despard, who spent a lot of time at Frenchpark, where her father was born, her brother General John French (1852-1925), who was involved in suppressing the 1916 Rising and became Lord Lieutenant of Ireland and Earl of Ypres. The three were also distant cousins of Douglas Hyde (1860-1949), the first President of Ireland, who is buried in the churchyard at Frenchpark, where he spent much of his childhood and where his father was the rector. 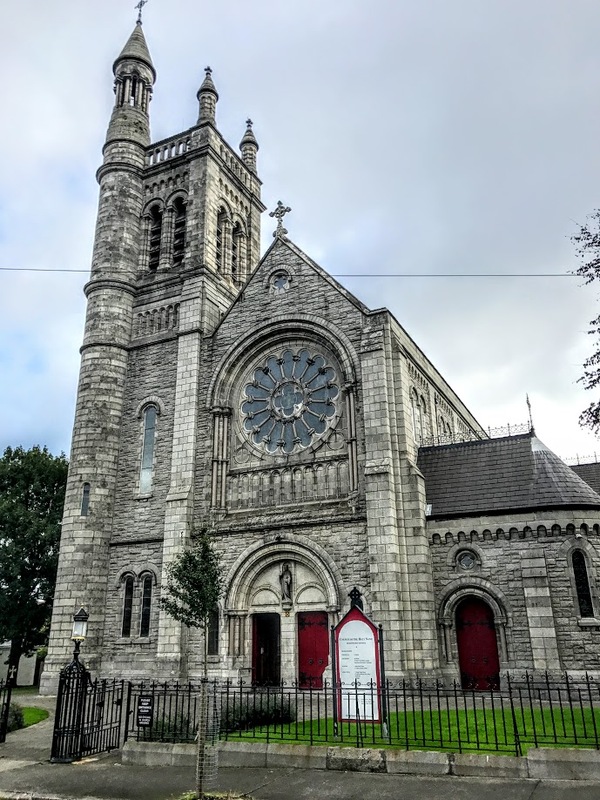 But the 1916 connections are closer, for the Church in Beechwood Avenue was also the venue for the wedding of the 1916 leader Thomas McDonagh and Muriel Gifford. Padraic Pearse was supposed to be the best man at that wedding, but forget to turn up … and that too is a story for another day. Twenty years ago, I awoke early on a Sunday morning to hear the news that Princess Diana had died in a car crash in Paris. At the time, I was Foreign Desk Editor of The Irish Times, and I had risen in the early hours because I was catching a flight to London and on to Seoul to take part in a programme in South Korea as a Visiting Fellow at the Institute for Global Economics. As a journalist, I knew the funeral of Lady Di was going to be a major story for all newspapers, and I had second thoughts about going to Korea. At the time, there were horrific stories of a growing famine in North Korea. I travelled to the DMZ, the Demilitarised Zone that still separates North Korea and South Korea, met diplomats, politicians, generals and business leaders, attended receptions, and joined other journalists, as well as diplomats and politicians in an intensive programme. As well as travelling to the tunnels and the border, and crossing the DMZ at P’anmunjom, I travelled throughout South Korea. On the day of Princess Diana’s funeral, I was invited to the British Embassy, but instead I opted to be entertained and dined by the Irish Columban missionaries in Seoul. September is ‘All-Ireland’ season, and the Irish priests working in Korea were anxious for the context of political and sporting ‘context’ – call it ‘gossip’ if you like – from home. I spent that Sunday morning at the Anglican Cathedral in Seoul, the Cathedral Church of Saint Mary the Virgin and Saint Nicholas. I returned with a diploma, with a letter from UN confirming I had absolved the United Nations of any responsibility should something untoward happen to me when I crossed the DMZ into North Korea, and with what journalists are tempted to regard as cutting-edge expertise in East Asian Affairs. Over the previous two decades I had been a visiting fellow on a programme in Japan, I had returned to Japan again, and I had been to both Beijing and Hong Kong twice, and I would return to China and Hong Kong many times after that. But, of course, there are no experts on North Korea and what happens there. Little did I realise that 20 years later, the expected implosion of North Korea as a late consequence of the fall of the Berlin Wall and the Iron Curtain, would not have come about, and that North Korea would once again be a major news story, partly because of the next generation of North Korean leadership, and partly because of an irresponsible presidential leadership in the US. The last Cold War frontier – the border between North and South Korea – stretches as far as the eye can see. 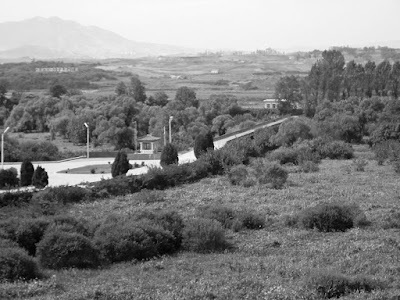 The electrified fences, with their look-out posts and tanks, stretch for 248 km, across the full width of Korea, dividing the peninsula close to the 38th parallel. Despite its name, the Demilitarised Zone (DMZ) is the most militarised zone in the world, with minefields, tanks, anti-tank walls, drop gates, a 3,000-volt electric fence and troops from both sides on constant alert. On the northern side, the countryside is bristling with camouflaged bunkers, tanks, artillery, nerve-gas and biological weapons shells, missile silos and landmines. Driving into the DMZ, the tension is palpable. There are regular checkpoints, there are tight restrictions on South Koreans entering the zone, and during the lonely drive across Freedom Bridge, the one-lane wooden bridge high above the River Imjin, heavily armed soldiers below are on high alert. Should anything happen, there is no turning back. Two Korean civilian villages remain inside the DMZ, one on each side of the dividing line. On the northern side, Kijongdong is used by seasonal workers who come in from Kaesong, 12 km away, to harvest the fields, and by North Korean troops who keep up a barrage of 12-hour propaganda broadcasts directed across the border. The only sense of permanence is the world's largest flagpole, standing at 160 metres. But the 31-metre North Korean flag has a deadweight of 600lb, and seldom blows in the light, early autumn breeze. The surrounding hillsides are covered with big bold white Korean letters proclaiming: ‘Self-reliance’, ‘We have the better system’, and ‘Follow the way of the leading star’ – a reference to Kim Jong-il, the North Korean leader who is watching his country edge closer to starvation and famine. On the southern side, Taesongdong is known as ‘Freedom Village’. There the villagers are among the most prosperous people in South Korea: they pay no taxes, face no conscription, farm over four times the land available to other families, and have an average income of $82,000 a family. But they face restrictions on their freedom too: they must be out of their fields by dark, and locked up in their homes by 11 p.m. each evening. On the southern side, visitors are taken to the Bridge of No Return, the last remaining road link across the peninsula, and the nearby site of a yellow poplar tree, where two Americans were hacked to death by North Koreans using axes in 1976. P’anmunjom, an hour’s drive from Seoul, the southern capital, is the truce village but this is still a region that teeters on war. Each day, both sides meet inside the Military Armistice Commission (MAC) Building which straddles the border. Outside, a thin line of cement on the ground marks the dividing line between North Korea and South Korea. Inside the building, the doors are slammed shut on the opposing side before tour groups are ushered in. Inside, it’s impossible to resist the temptation to walk around the dividing table and cross the border marked by the microphone cables. Outside, North Korean soldiers press their expressionless, grim faces against the cold window panes. There is no contact, no greeting, no sense of humour to break the ice in this Cold War drama. If the DMZ makes one ironic contribution to the quality of life decades after the armistice, then it is the environmental paradise created in a 4km-wide zone sealed off from all human beings for 44 years. Safe from human predators and hunters, preserved from the industrial and commercial developments that have sprung up in South Korea’s booming economy, the DMZ is one of the rarest temperate habitats in the world. Siberian tigers have been sighted in the DMZ. It is home too to a large flock of Manchurian cranes. Yesterday, in a gesture of goodwill towards the United States, North Korea handed over the remains of a US soldier, believed to have been killed in the Korean War between 1950 and 1953. The remains, in a simple aluminium coffin draped with a UN flag, were handed over by North Korean soldiers to a UN honour guard and at the end of a brief ceremony at P’anmunjom. The bodies of more than 8,100 Americans who died in the Korean War have never been recovered. The US still has 37,000 troops stationed in South Korea, and yesterday's goodwill gesture came a day after North Korea agreed in Beijing to hold bilateral talks with the US in New York next week and to attend four-party talks with China, South Korea and the US. For the first-time visitor to the South Korean capital, Seoul appears detached from the Cold War's last remaining tensions. But the border at P’anmunjom is less than an hour’s drive away – and technically, North Korea remains at war with South Korea.